Traditionally, one of the most complex 5-axis challenges is generating toolpaths for impellers, fans, marine screws, and other bladed parts widely used in power generation, energy transfer, and propulsion. 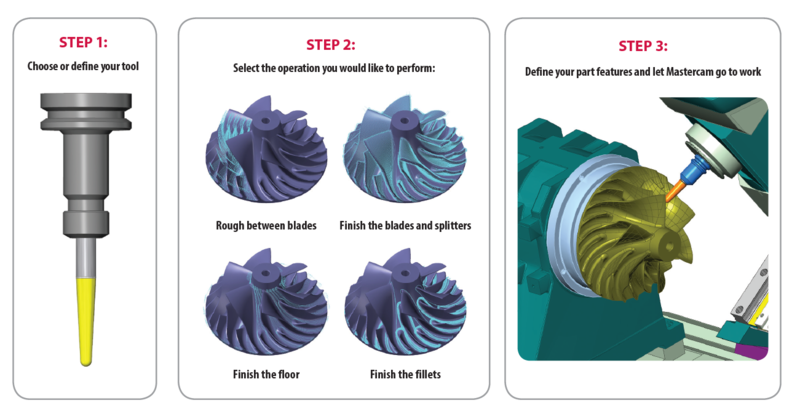 Blade Expert is a powerful, easy-to-use, custom application designed to generate efficient, smooth, and gouge-free toolpaths for these complex parts. It minimizes unnecessary motion at the machine, delivering a highly-efficient toolpath with superior finish quality. "Precision turbines and fans are tricky to manufacture. We added Blade Expert to our shop’s ‘toolbox’ because it gives us complete control and doesn’t require a lot of training. It definitely keeps us ahead." The interface follows the already well established Mastercam standard, used by all other multiaxis toolpaths, ensuring a short learning curve. Supports straight, bull, and ball nose cutters. Automatic tool axis control for safe toolpaths. Accurate tool tip control for seamless blending and transformation. 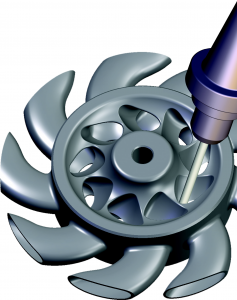 Mastercam Blade Expert is a Mastercam Add-On that must be purchased separately. It runs on Mastercam Mill 3D, Mastercam for SOLIDWORKS 3D, or Router 3D. For more information, click here.